•Actual instrument shown - please click on images to enlarge. •5 pc maple neck with wenge fingerboard and matching headstock. *The Super-Fatty pickups including the shells are made right in our shop here in Canada. They feature an end to end humcancelling coil array with neodymium magnets and hardened steel poles. The coils are noise-symetric/tone-asymetric, which means they maintain near-perfect noise rejection with increased low-end clarity. They have been designed to combine Super clarity on the B and E strings with increased warmth and Fatness on the D and G-strings. Their tone has been described as very clear and transparent on the bottom and very smooth and punchy on the top. They they have a natural overdriven quality when pushed hard that is similar to a vintage tube amp. They feature 4-lead wiring which enables the internal coils to be wired in either series for strong mids and high output or parallel for scooped mids and n normal output. Northern Ash on the bass side adds great sustain, clarity and punch to the B and E strings. Alder on the treble side keeps the G and D strings nice and warm sounding. The traditional way of combining body woods to control tone is to laminate horizontally. For example laminate a thick maple top on a mahogany core to increase the brightness of the mahogany. This system works well to alter the tone response of all the strings as a group. However, our experience with the Novax Fanned-Fret ® system has opened up a whole new way of thinking about an instrument. What if we could take this concept one step further by focusing on the needs of the bass and treble strings separately? In effect creating a body that naturally balances tone between the bass and treble strings. At the time this had never been done before. To achieve this naturally equalising body we turned traditional thinking on its side by laminating across the width of the body. This allows us to use a higher density wood such as Northern Ash for the bass side to accentuate the highs and give power to the lows without affecting the treble strings. We then use a lower density wood (Alder) for the treble side to bring out the resonance and warm up the treble strings without making the bass strings sound muddy. For such a simple idea the results are pretty dramatic – warm, punchy treble strings with solid snappy bass strings. 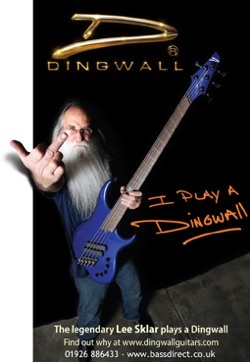 There’s no mistaking a Dingwall bass. With their distinctive Novax fanned-fret design you’d be forgiven for thinking you were looking at an optical illusion of some kind, but it’s a system that is now being embraced by a host of top name players including Dave Swift (Jools Holland), Jon Burr (Stan Getz, Chet Baker) and Lee Sklar among many others. The fanned-fret system is designed to facilitate the most appropriate scale lengths for each individual string. It’s a logical system that enables a 5-string bass (for example) to use a full 36” scale on its B string, with a 34” scale on the G string. This allows for clear, well-defined notes across the whole range of the instrument and is a unique concept that is applied across the whole of the Dingwall range. The two instruments on review here represent two different price points for the Dingwall range. 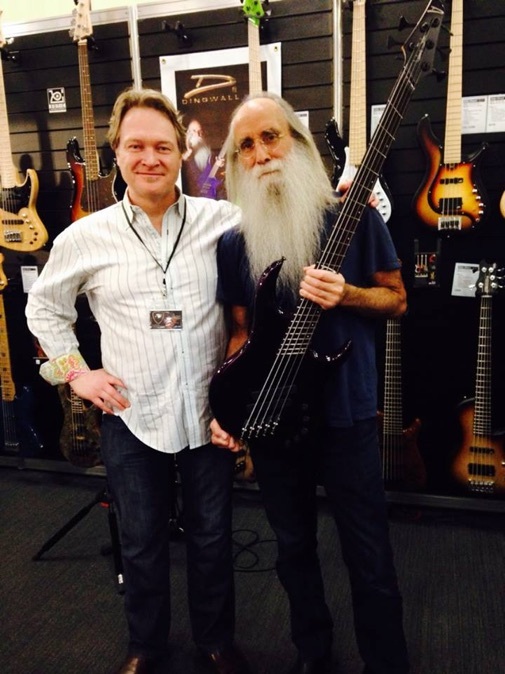 At the upper end is the Lee Sklar 5-string bass, built for the legendary session bassist and retailing at a hefty £4,000. Dingwall have built basses for Sklar for over ten years now, and this new signature model combines all of his favourite features, with gorgeous finishes that reflect his love of hot rods. 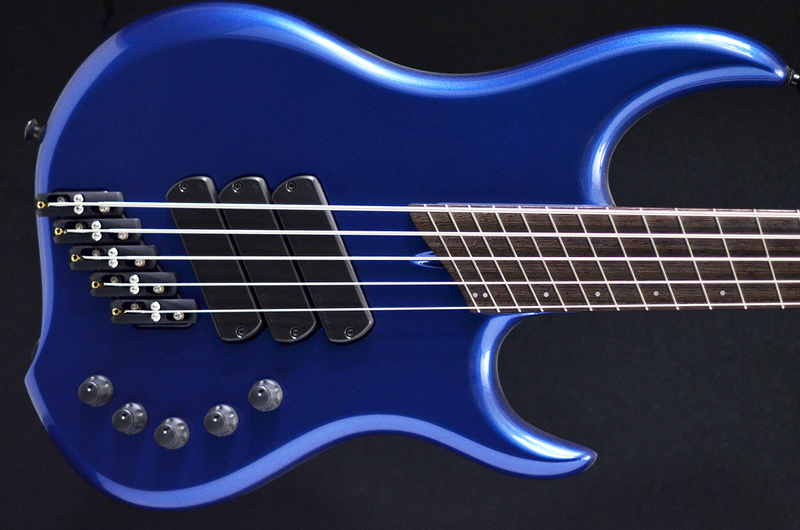 At the other end of the spectrum we have the rather more affordable ABZ 4 bass, a 4-string instrument retailing at £1,685. 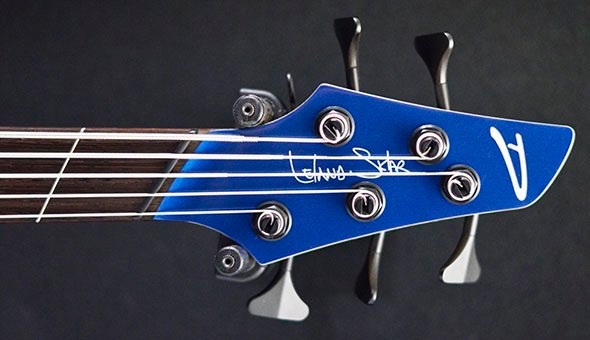 The ABZ series combines the fan fret technology with a sleek, streamlined body that makes this instrument a perfect introduction to the Dingwall brand. First up on the bench is the Sklar model. This bass is constructed using a unique to- Dingwall construction method that couples a piece of northern ash with a piece of alder. However, rather than use an alder body with an ash laminate top, as is often seen on other instruments, the pieces are placed side by side. Ash is used for the upper part of the body (where the lower strings are sited), while the alder is used on the lower half (where the top strings are sited). As these woods have different densities, the result is a naturally equalising’ body: ‘the higher-density ash accentuates the highs and gives power to the lows without affecting the treble strings’. Similarly, the low-density alder ‘brings out the resonance and warms up the treble strings without making the bass strings sound muddy’. It’s a unique build feature that makes a lot of sense. 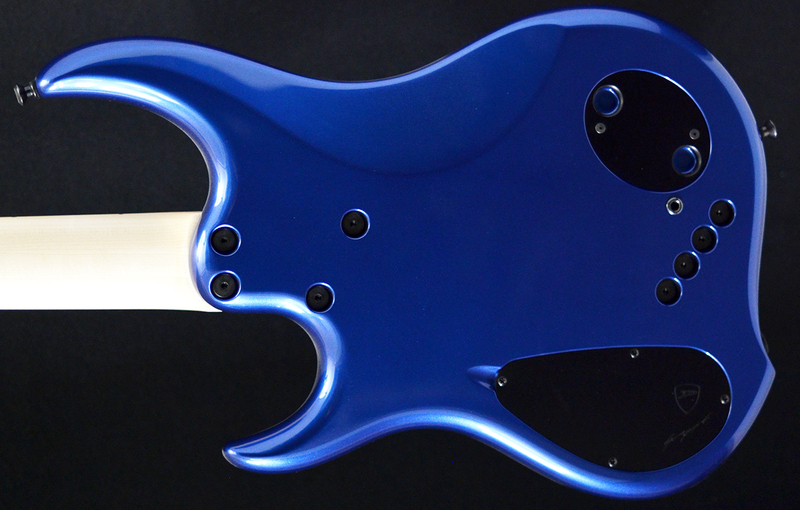 The body on our test bass is finished in a colour called ‘blueberry’, with a polyester finish. There is a generous amount of edge contouring and an attractive cutaway by the bridge, which makes access to the Neutrik jack socket easier as well as allowing the instrument to stand safely against a wall without falling over. 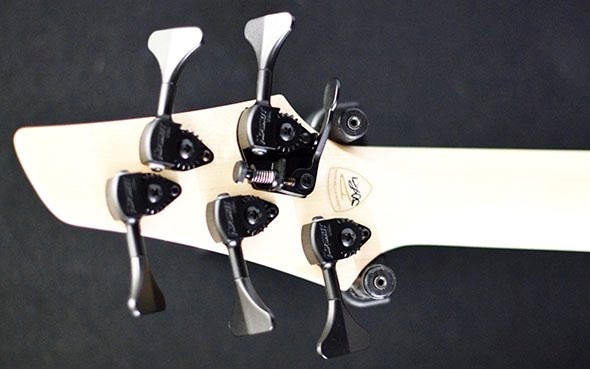 The five-piece maple neck is a bolt-on design and affixed with Allen screws sited in recessed circular bevels. Removing four screws accesses the control cavity on the Sklar bass. A recessed ‘finger hole’ allows you to easily lift the cover off – a fantastic idea that we’re surprised not to have seen on more instruments. The cavity itself is immaculately shielded, with extremely neat wiring. Cable ties are used to keep wires bunched together, making for a very neat and ordered compartment. Top marks. Next up is the ABZ 4. The body of this instrument is a single piece of swamp ash, again combined with a bolt-on five-piece maple neck. Our test instrument was finished with an indigoburst satin finish – very different to the Sklar bass, but appealing in a different way. The same overall body shaping is evident here, although slightly refined into a sleeker instrument. The cutaway section at the bridge is once again present, allowing comfortable access to the jack socket. As on the Sklar bass, the bolt-on neck design comprises four Allen screws in recessed circular bevels. Th e control cavity on the ABZ is accessed in the same way minus the added finger hole. Once again, wiring and shielding are exemplary, altogether some of the neatest work we’ve seen. Fretwork on both instruments is superb and the action on the Sklar bass is set appropriately, while the ABZ needed some tweaking. The most obvious feature on both instruments is, of course, the unique fan fret design that Dingwall are renowned for, but the fun doesn’t stop there: both basses also have backward-angled pickups (more noticeably so on the Sklar bass) and the staggered bridge saddle design that accommodates the different scale lengths of each string. Dot position markers on both instruments are sited on the lower part of the fingerboard, while a stylized ‘D’ motif adorns the 12th fret of the Sklar bass. Both basses come equipped with a Hipshot extender key on the lowest string (on the Sklar bass this drops the B string to an earthshaking low A), although this is an £85 optional extra on the ABZ series. 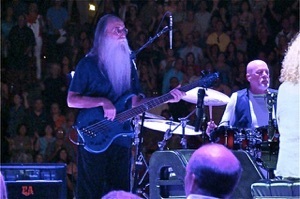 Both basses have slim frets, a feature that was introduced to Dingwall by Lee Sklar. Th e benefits of thinner frets are a ‘more woody, less metallic tone, smoother glissandos and a faster feel’. The ABZ bass comes with standard ‘banjo’ frets – which Dingwall state is the same size as what you would find on most guitars from the 50s and 60s – while the Sklar bass features mandolin frets, which are thinner still. Th e ABZ bass is fi tted with FD3-4L pickups, while the Sklar has Z2 Super-Fatty models paired with a Glockenklang three-band EQ circuit. 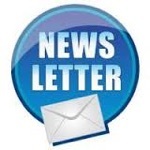 The Super-Fatties are made at the Dingwall workshop in Canada and, according to Dingwall, have been constructed with an end-to-end hum-cancelling coil array with neodymium magnets and hardened steel poles. Th e coils are also noise-symmetric/ tone-asymmetric, meaning that they boast near perfect noise rejection along with increased low-end clarity. Lee chose these pickups as they combine clarity on the B and E strings with increased warmth and fatness on the D and G strings. Th e FD3-4L pickups, on the other hand, are the evolution of the original Fury Dingwall pickups that were developed by Sheldon Dingwall and Glenn McDougall of Fury Guitars. Again, these feature neodymium magnets, humcancelling matched-pair coils and hardened steel poles, and are fully shielded for quiet performance. Dingwall’s literature notes that these pickups are a ‘blend between a J and a P but with more highs, more lows and more dynamic response’. The pickups on both basses feature four lead wiring, enabling the coils to be wired in either series or parallel. At a significantly higher price point it’s unsurprising that the Lee Sklar model comes with a few extra bells and whistles. One of the most impressive of these is the magnetic battery cover sited on the rear of the top bout. This oval plastic cover has two holes for finger and thumb to grab the plate and remove it. Strong magnets hold the plate in place, meaning that there’s no danger of it falling off mid gig. This has to be the quickest battery access method we’ve seen – it’s certainly the coolest. Plugging in the Sklar bass was really a rather memorable experience. Th e overriding tone of the bass is very gutsy, with a lot of punch. The low end is clear and well defined, and the tone is even across the whole instrument. Turning our attention to the control set we found a three-band EQ, master volume and a four-way selector control that has positions for front pickup soloed, both pickups in parallel, both in series, and neck pickup soloed. Existing Dingwall users should note that this control is wired to Lee’s preference, which is to have these positions placed in a slightly different order. The first position wires the pickups in series and the result is a powerful, well-rounded tone that sounded phenomenal through our TC Electronic test rig (set fl at). With this setting the bottom end was full but well defined thanks to the enhanced mids, while the top end remained clear without too much ‘sizzle’. It worked well for both fingerstyle and slap playing, and sounded great in a band setting. The next position soloes the neck pickup and in comparison to the previous setting is slightly thinner sounding in the low-mid range. The third position wires the pickups in parallel which results in a scooped tone, ideal for 80s-style slap sounds, while the final position soloes the bridge pickup for a biting fingerstyle tone that is guaranteed to cut through the mix. Overall, the Sklar bass off ers an exceptional tonal palette that caters for everything a busy session player like Lee would need. Turning our attention to the ABZ bass, we have a far simpler set of passive controls: a master volume, another four-way selector switch (with positions for bridge, both parallel, both series, neck) and a tone control. With passive electronics and no EQ controls, the ABZ has a more traditional-sounding range, but we found old-school slap tones, biting fingerstyle and everything in between well catered for. As with the Sklar bass, wiring the pickups in series resulted in a full, fat tone that would work for the majority of recording/live situations, while a scooped tone was the result of wiring in parallel. The toggle control might not be to everyone’s tastes – particularly if you are used to using a standard blend control – but the range of sounds on offer is undeniable. In use, the most obvious difference with these instruments is the Novax fanned-fret design. is was our first time playing a Dingwall, and we anticipated a period of adjustment with our left-hand positioning. Yet we found that for the most part little or no adjustment was required – as unnerving as it can be to look at the fretboard and see sloping frets, our fingers still seemed to land in the right places and we were able to get around both instruments comfortably. It’s a little different in the upper register as the angles become more obvious, which combined with the smaller frets means that you have to be quite careful when playing melodic lines. Playing chords also required some adjustment – for example, playing the interval of a fourth in the upper register requires a slight adjustment. Overall, however, we were stunned at how easy it was to get around these instruments, and would have no hesitation in playing one on a gig. Both the Sklar bass and the ABZ are stunning instruments that reflect forward-thinking design elements combined with superior craftsmanship. These two very different models occupy different price brackets and certainly the ABZ is priced sensibly in the lower half of the high-end market. There are cheaper Dingwall basses available (such as the Chinesemade Combustion) but this is undoubtedly one of the more affordable of Dingwall’s handmade basses, and is most certainly worthy of your attention. The Sklar bass, retailing at £4,000, is a far more serious investment, but again, there’s no denying the level of craftsmanship, design and sheer playability on offer. These factors, combined with a stunning sonic palette, should make it a serious contender for anyone looking for a top end instrument that not only looks amazing but can deliver the goods in any situation as well. We’d have no hesitation in recommending either bass for an immediate test drive. Minus: No complaints about the instruments themselves, but the Sklar model will be too pricey for many. Overall: Two beautiful basses, great sounds, great to play.